Are these not incredible?!! Seriously, you both blew us away!! Congratulations to Yoonsun and Clare!! Please watch your email inboxes for information about your $25 Gift Certificate to the Avery Elle store! And thank you for sharing your amazing work with us!! There were several projects that also captured our hearts, and we’d like to give those ladies a shout out for a job well done!! So you can see now why we had such a hard time choosing winners, right?!! Ladies, your projects were stellar and we are so incredibly happy that you shared them with us!! Thank you to all who played along. We so enjoy seeing your creativity blossom and explode in response to our challenge prompts! You all just knock it out of the park!! We hope you’ll stop by tomorrow for our next challenge, and the first challenge with our new Challenge Team!! You’re going to be amazed!! Thanks so much for the mention! Congrats to all, this was such a fun challenge! Oh WOW, big Congrats to both winners! Congrats to Yoonsun and Clare, and thanks for the shout out for my card - it was a fun challenge! 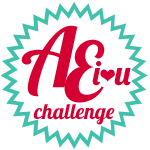 Announcing the New AEI♥U Challenge Team! !